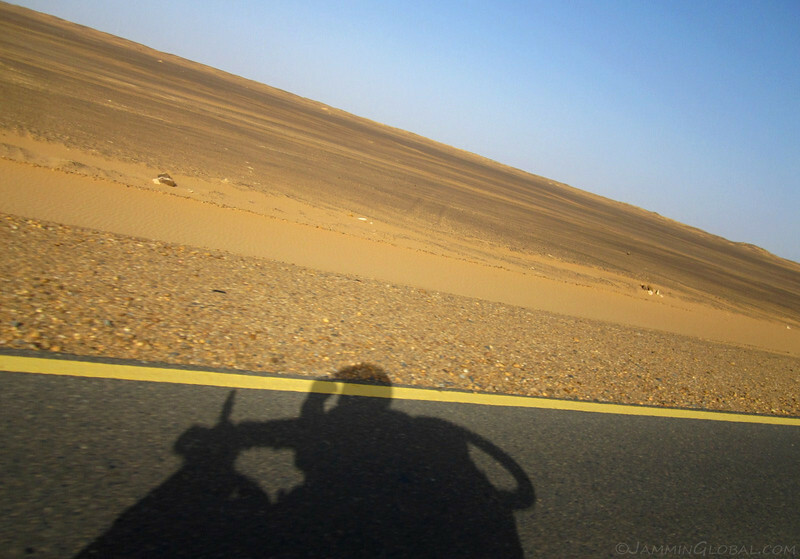 After being filled with wonderful impressions of the Sudanese people from my stay in Quikkah, it was time to cover some miles and cut across northern Sudan. 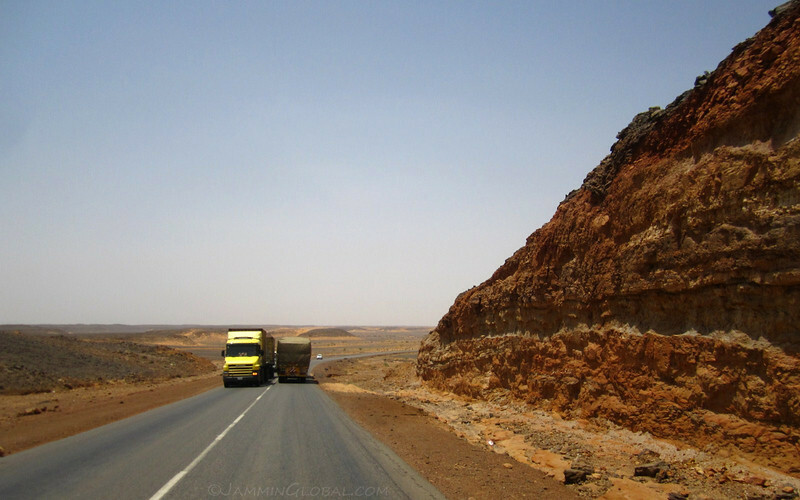 The roads were all paved and the landscape was flat through this part of the Sahara. The intense heat dictated my riding schedule and kept me on the go. 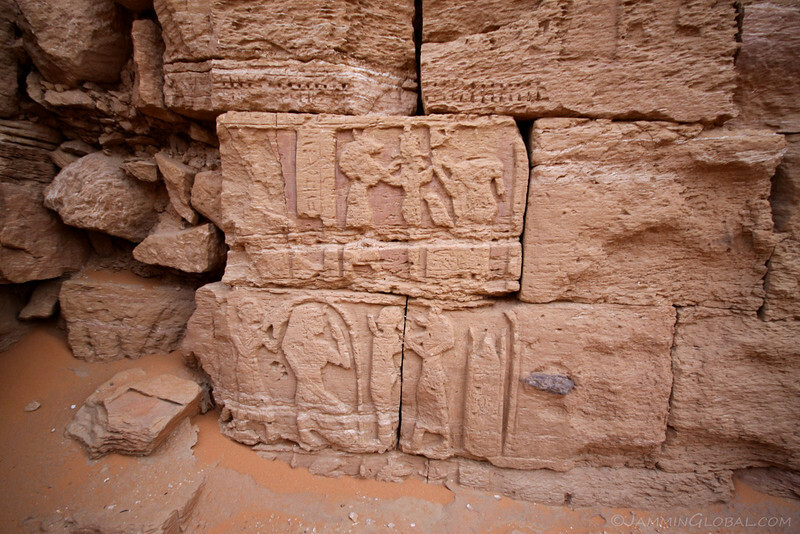 I passed through the towns of Dongola, Karima and then paid a visit to the Pyramids of Meroe at Begrawiya, before heading into Khartoum. 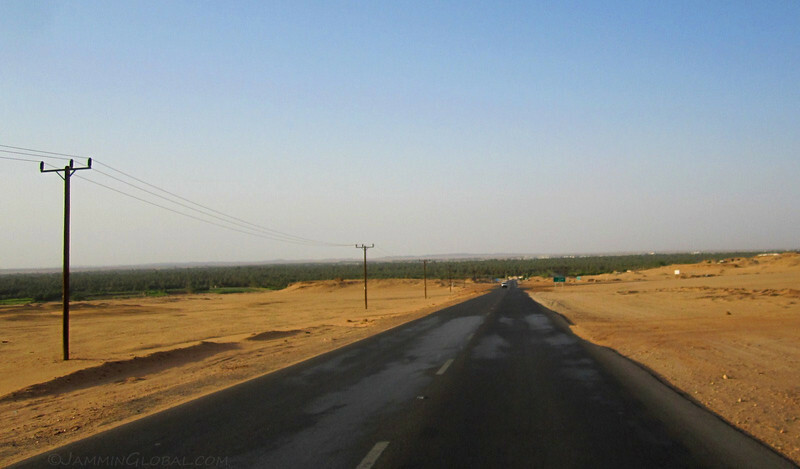 South of Quikkah, heading to the regional capital of Dongola, 215 kms (136 mi) away. This brand new road was laid down by the Chinese and I’m wondering what the solid yellow line on the edge of the road means… It’s nice to have some color in the desert, but my road rules tell me it should be white. I rolled into Dongola, the first sizeable town heading south into Sudan, and got there by 11 am. Just like the locals, I quickly found shelter to hide away for the hottest part of the day. Everything shuts down from around noon till 5 pm. 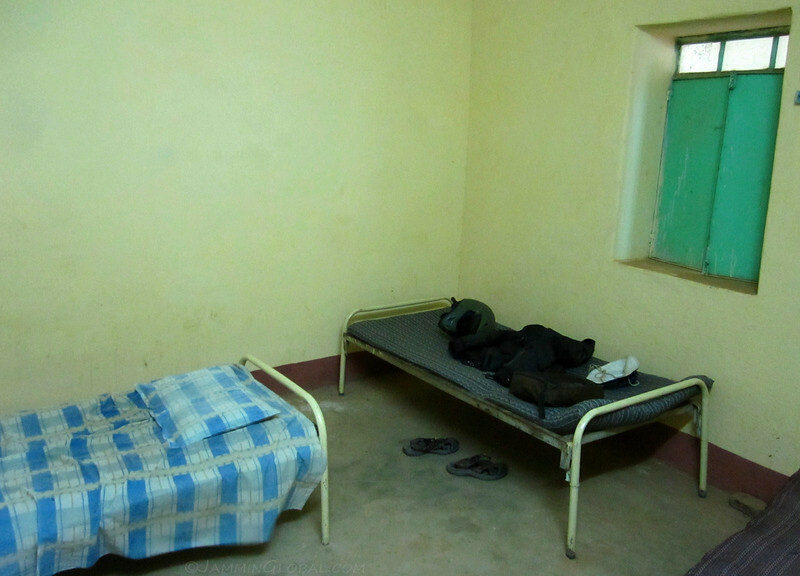 For 10 Sudanese Pounds ($4.50), I got a shared room at the Lord Hotel and indoor parking for sanDRina. There was a ceiling fan that made the inside slightly cooler than the oven outside. 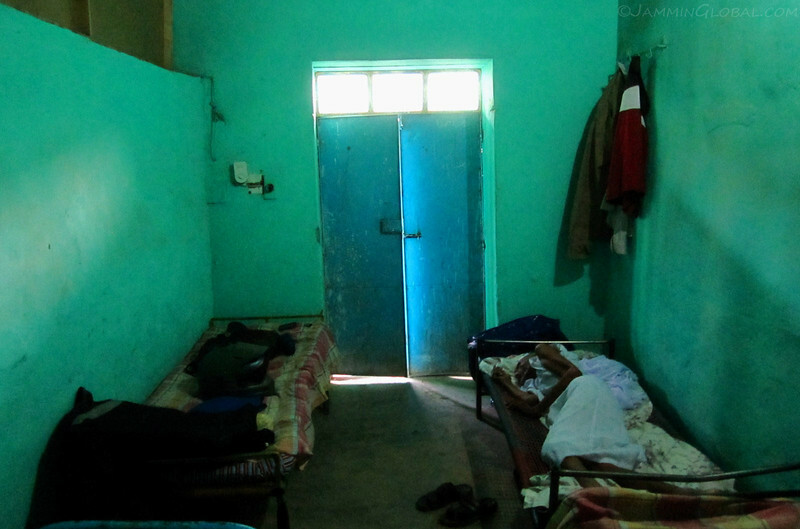 My roommates were a few older gentlemen who looked like long-term residents, just hanging out and sleeping. I enjoyed multiple cold showers and the ice-cold drinking water from the clay urns. 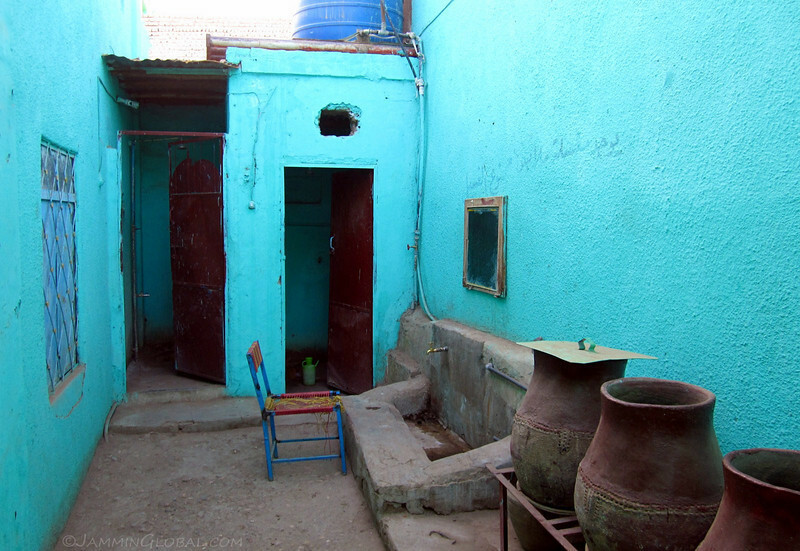 I think that chair is there for the elders and I sat there while brushing my teeth. 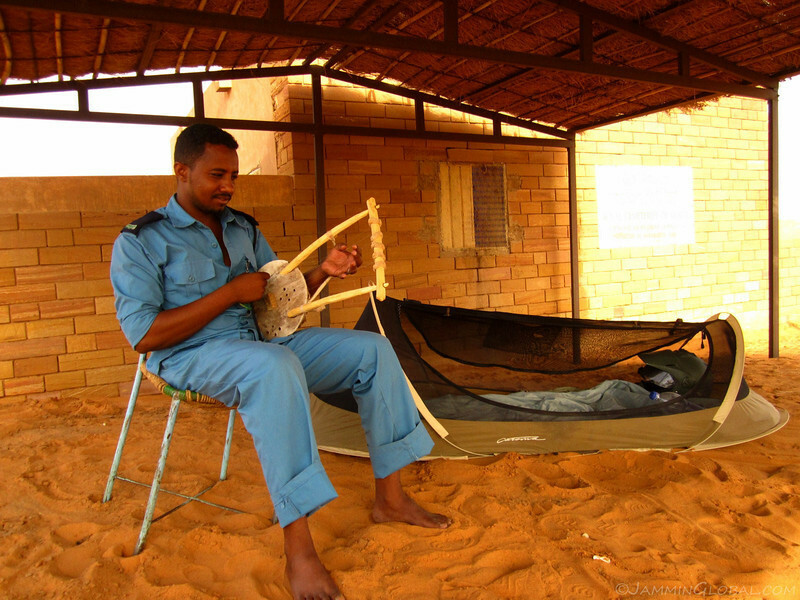 While the Sudanese people are extremely friendly to foreigners, the government on the other hand doesn’t trust us and requires foreigners to register with the police in every town that we stay in. We’re actually not allowed to even check-in to a hotel until we register as hotel managers can only allow foreigners to stay after they’ve registered with the police. Luckily for me I arrived just as the police shut down for the afternoon and could go in the evening to do my registering. 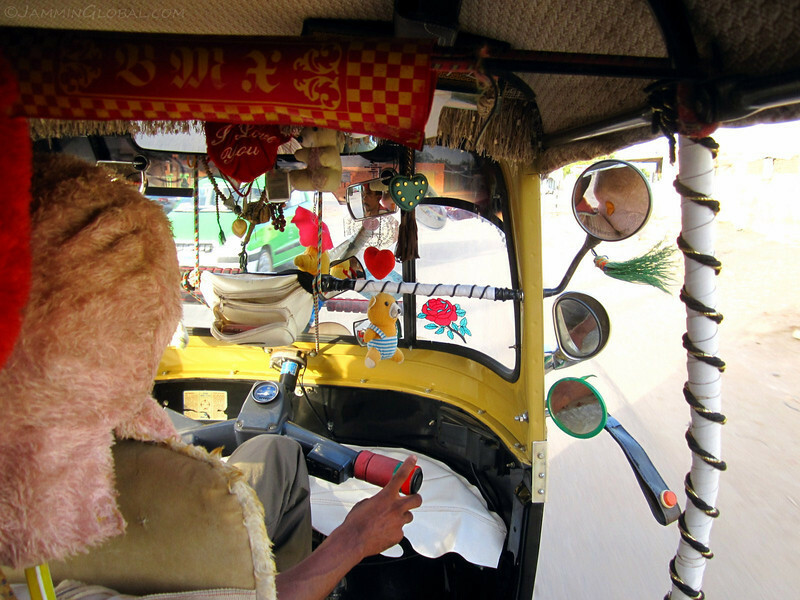 The manager got me an auto-rickshaw (tuk-tuk) to take care of business. 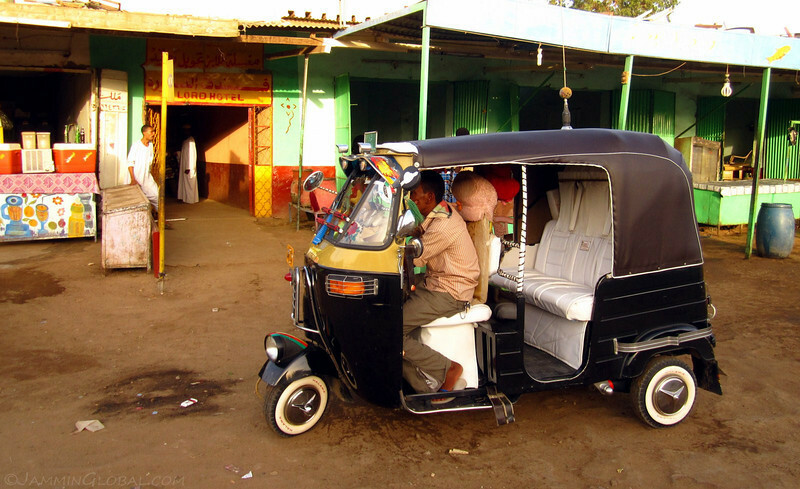 It had been a long time since I’d been in an auto rickshaw and I enjoyed the ride through town. The police were friendly and asked to see my passport and travel permit before issuing my registration receipt that I had to give to the hotel manager. Got to keep on top of all the bureaucracy in these countries. A foreigner’s presence spreads fast in these towns and I was told that if I avoided getting registered, the police would come for me. Once all that paperwork was taken care of, I strolled through town and came across the market, which was just reopening for the second part of their day. Here, a date seller had many different kinds with varying prices. 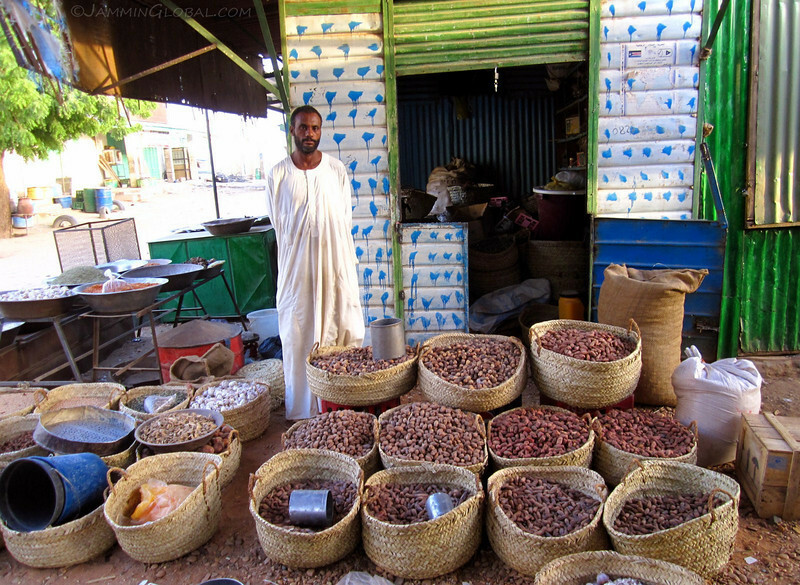 The dates in Sudan were different than the ones in Egypt as they’re drier but have more of a caramel taste. 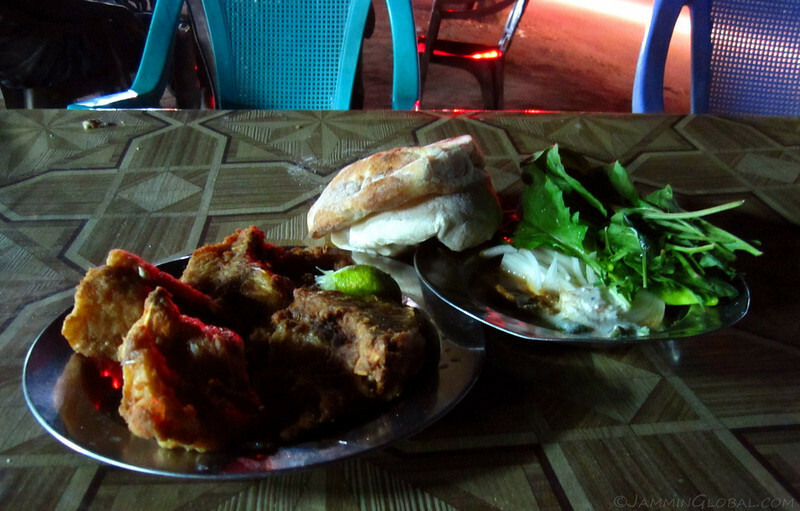 In the evening, I found a road-side restaurant and had this tasty fish fry for dinner, SP 6 ($2.75). I people-watched and observed the evening life of Dongola, which goes on past midnight, to make up for the shut down during the day. 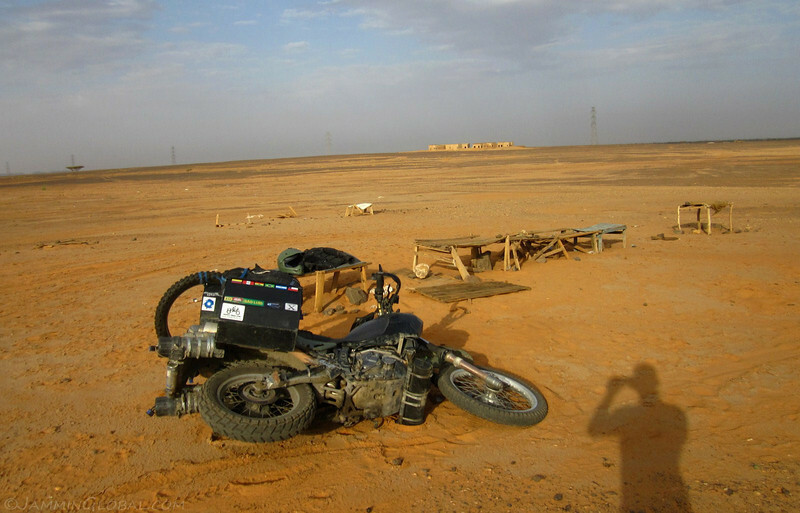 The next morning, I had an early start and was rolling by 7:30 am, heading for Karima, 220 kms (136 mi) southeast of Dongola. This is where I departed from the Nile as this route cut across a bend in the river and headed straight through the desert. The bleak landscape was dotted with a few shrubs and I was surprised how the ride reminded me of my time in the Argentine Patagonia. The mornings in the desert here and the deserts of Patagonia were both still and tranquil. An ambient trance track by Chicane came up on my playlist and I was feeling rich in awareness as sanDRina glided through the landscape. That moment ended as the Sun rose ever higher. By 9 am, the heat was becoming intolerable and I felt my feet burning inside my thick plastic motocross boots. Safety first. 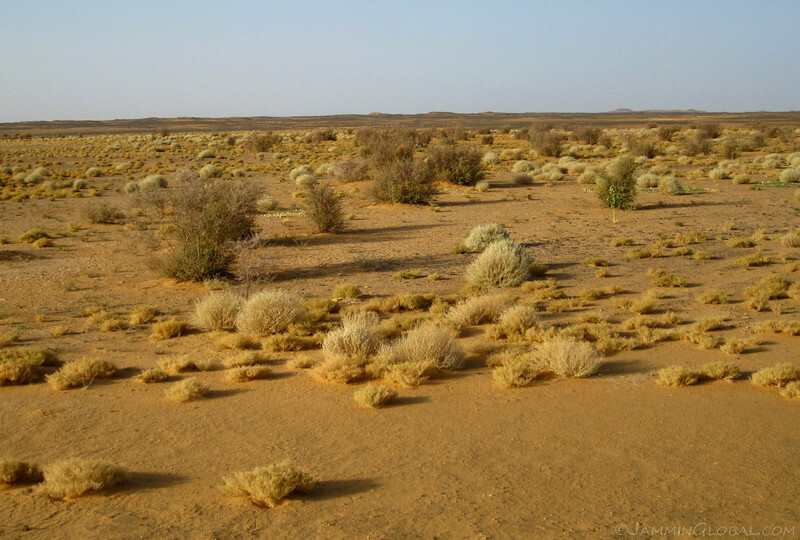 Depending on your perspective, that landscape is either bleak or vast. I like vast spaces. It makes me feel small and insignificant on this massive planet that we inhabit. 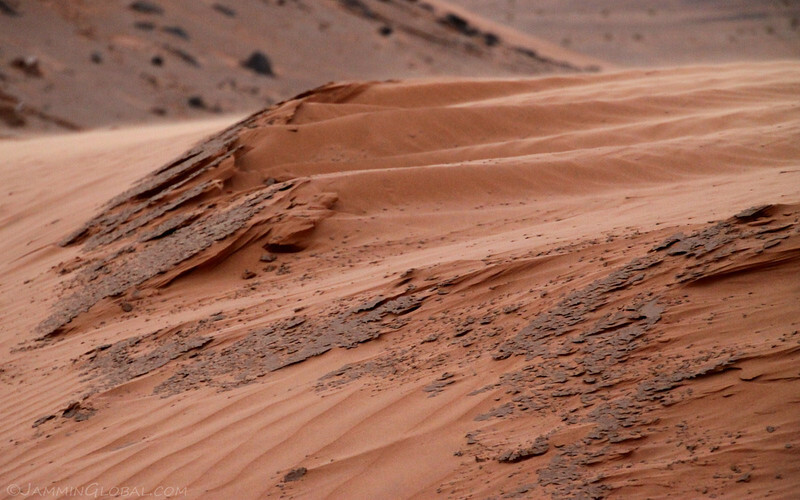 Ridges in the sand of northern Sudan. I had my water bladder from Klim feeding into my helmet now and was constantly sipping water through the ride. A few seconds without water would leave my mouth completely dry and I was thankful to have the capability to constantly hydrate. My riding suit is full Kevlar mesh, which makes it comfortable when I’m moving as air flows all over my body. But this flowing hot air, as it keeps my dermis cool, takes away a lot of my water. As the temperature picked up, so did the winds. 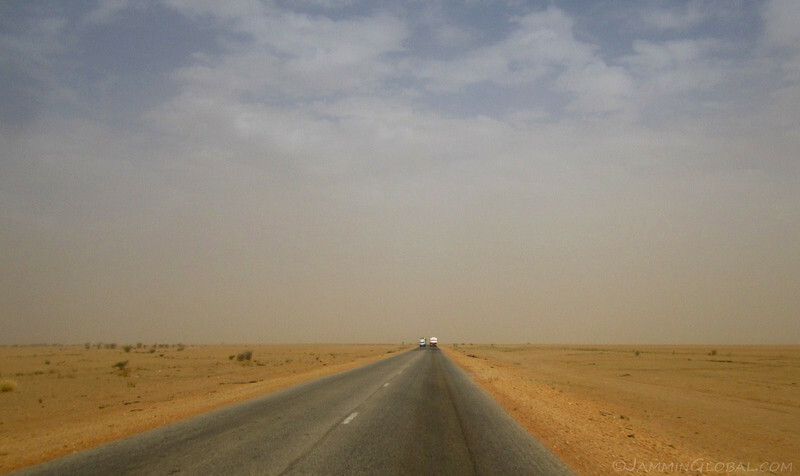 It was a marked change from the calm of the early morning to the near gale-force, sand-laden winds of the mid-morning. Just like Patagonia, minus the sand and the mercury. 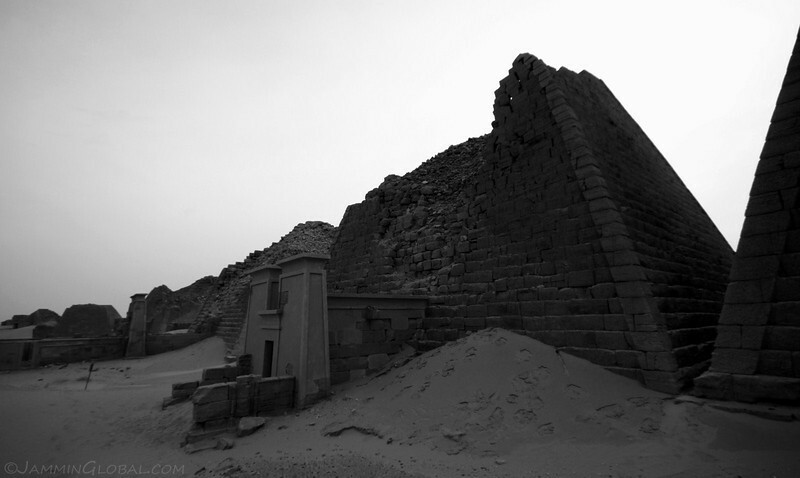 Around the town of Karima, back on the Nile, lies various ruins that make up the Jebel Barkal site. 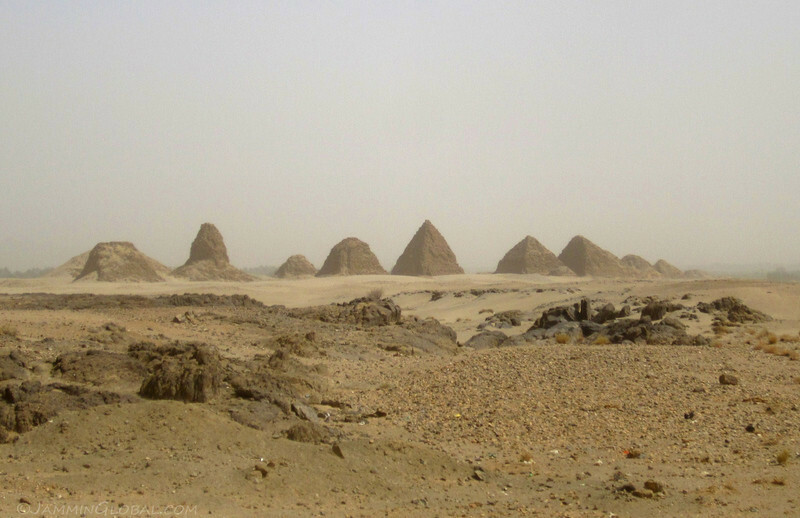 These steep-sided pyramids, in various states of decay make up the royal cemetery of the Napatan civilization that existed here around 1,000 BC. Across the river is the geological landmark of the Jebel Barkal mountain, which marked the southern boundary of Egyptian Pharaoh Thutmose III’s empire. 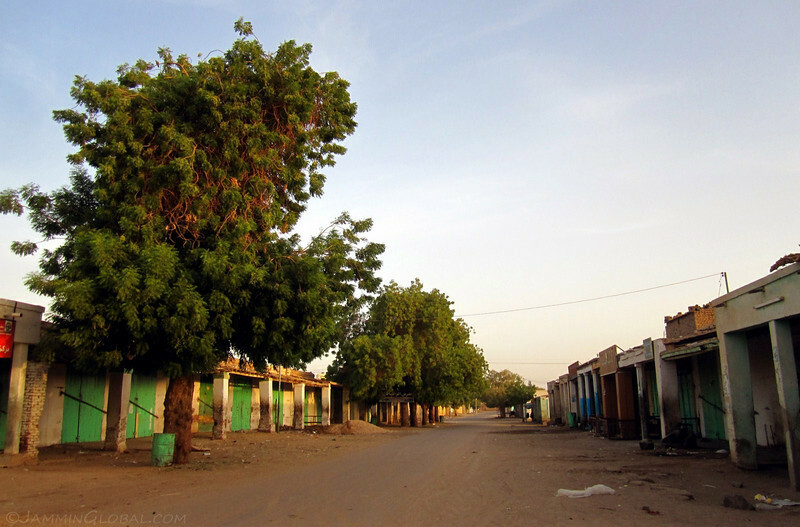 Unlike tourist sites in Egypt, the ones in Sudan were void of crowds and touts. After registering with the police, I got myself checked-in to Al-Nassr Hotel in Karima. …while I tried to stay cool by guzzling lots of water. A bed inside a room here went for SP 10 and if I had opted to sleep outside, it would’ve been only SP 7. 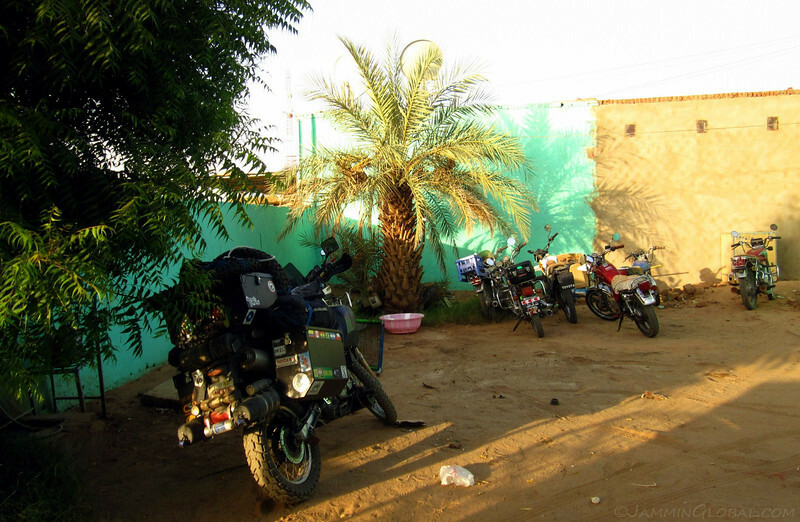 Back on the road, early the next morning and I enjoyed riding towards the green band of vegetation along the Nile. But it didn’t last long. 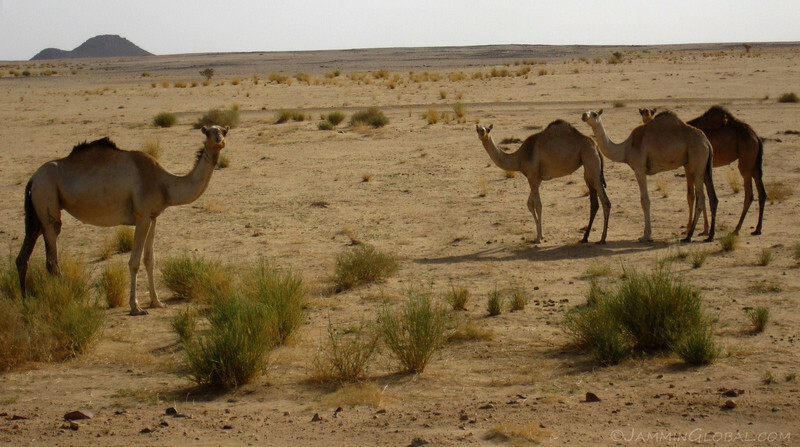 Camels in the Sahara. I don’t think they were wild, as someone probably owns these desert cruisers. 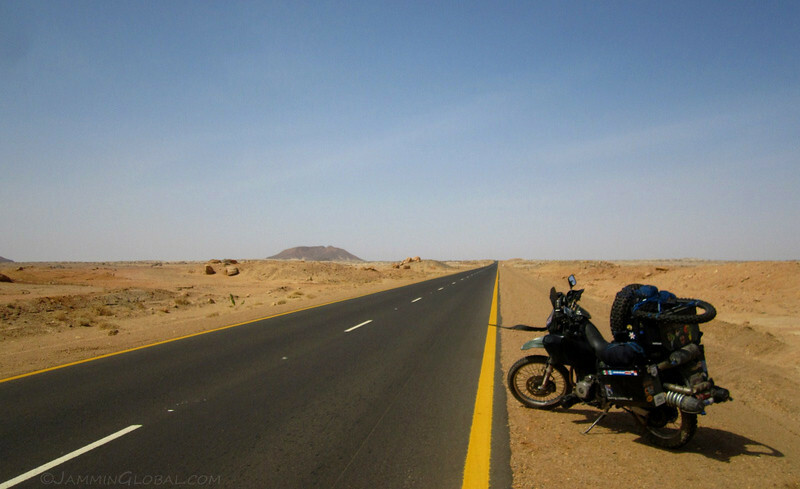 The route from Karima to Atbara again cut across the desert, instead of following a bend in the Nile and I did that 300 km (186 mi) section with no breaks, a record for me. I was just in a zone, constantly sipping water and listening to an audio book that kept my attention rapt. It was one of Arthur C Clarke’s stories, Richter 10. When the ride becomes mind-numbing, I use audio books to keep fatigue at bay. 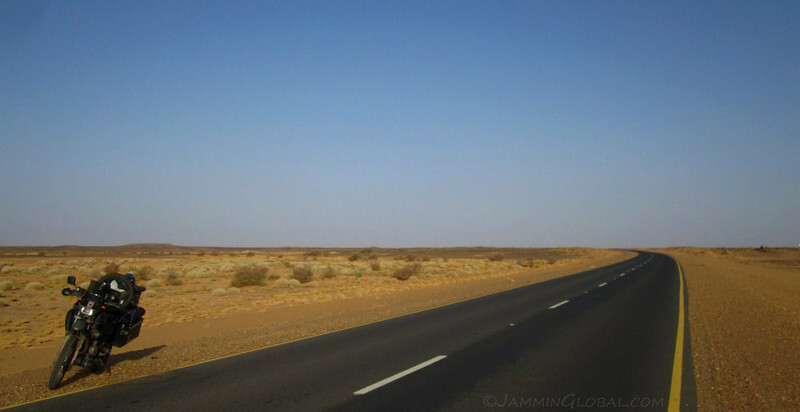 From Atbara southwards, the ride lost its desert solitude as this part of the highway forms the main commercial artery for Sudan. 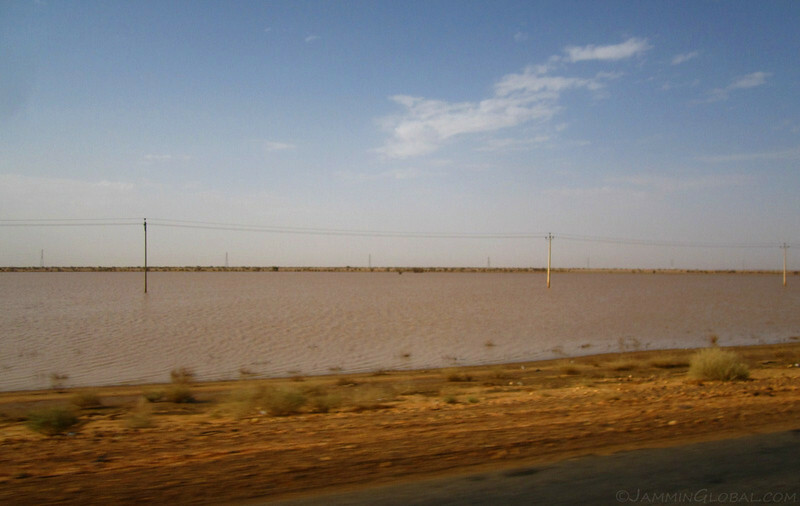 It links the capital of Khartoum with Port Sudan on the Red Sea, through which almost everything flows into and out of the country. The two-lane road was packed with trucks and that too most with double trailers, which made over-taking even more fun. I finally got some elevation change, but it was short-lived. I enjoyed looking briefly at what the geology is like, under the skin here. 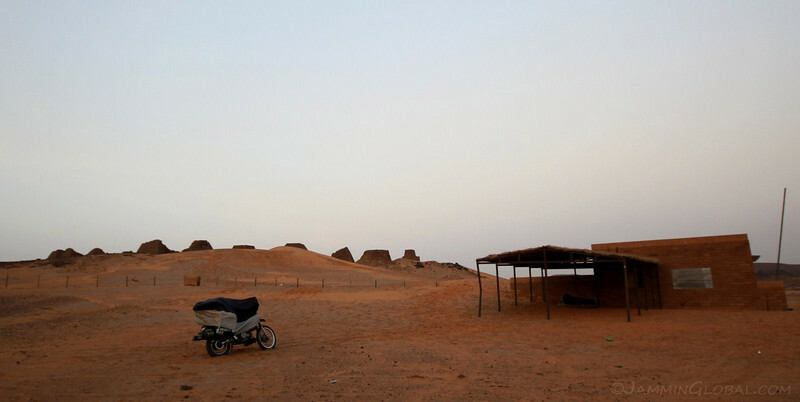 At just past noon, I arrived at my destination for the day, the Pyramids of Meroe at Begrawiya. There was a small tourist office and some shelter from the Sun, but nothing else around. I got sanDRina as close as possible without digging her into the sand and got set to hang out until it got cooler to visit the pyramids. A donkey for tourists. 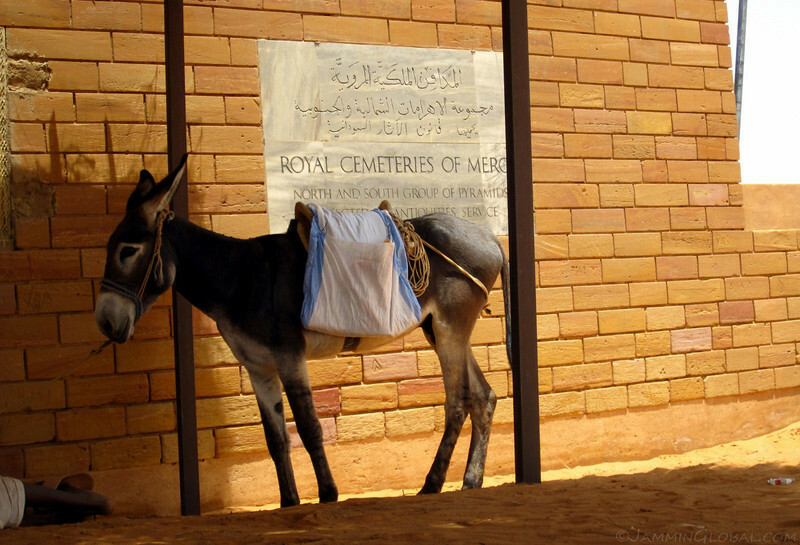 The official name for the site is the Royal Cemeteries of Meroe, which house the remains of the rulers of the last Kingdom of Kush. 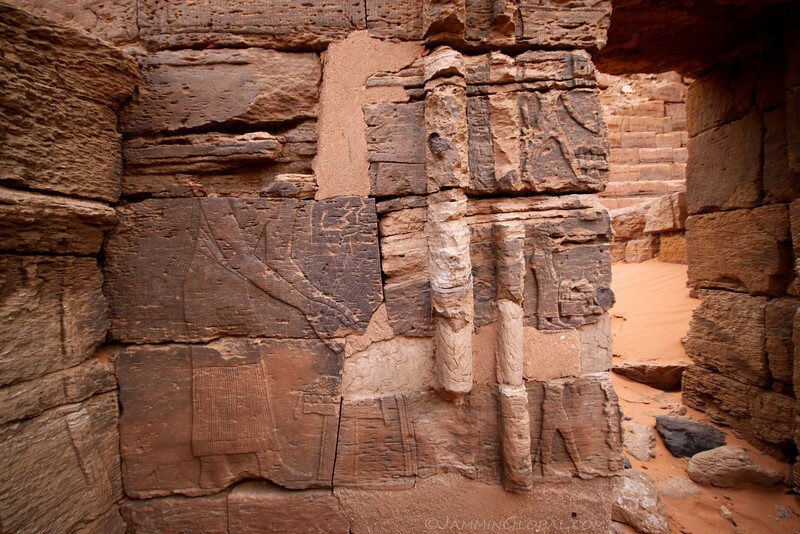 There were three Kushite kingdoms, one at Kerma (2600 – 1520 BC), another at Napata (near Karima) from 1000 – 300 BC and the last one here at Meroe (300 BC – 300 AD). This was the lady who was in charge of the ticket office and after quickly charging me the entrance fee of SP 20, she decided to call it a day and head home. 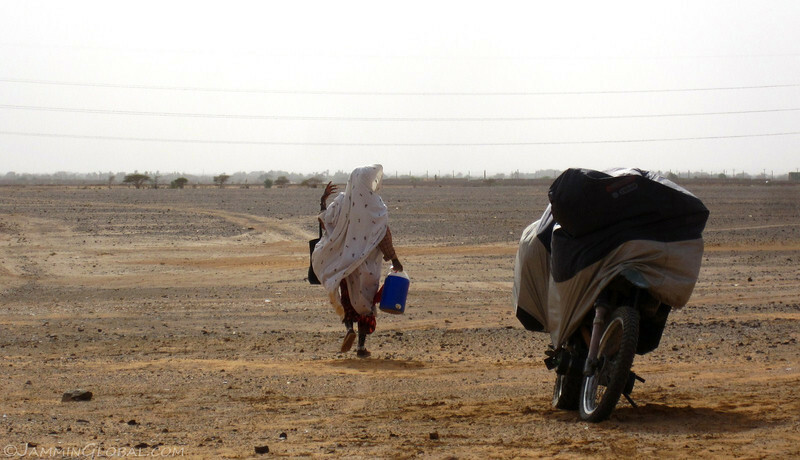 She’s walking to the highway with her water cooler. Like most other remote tourist sites, if I had arrived after office hours, it’d be free. She said about one or two tourists show up everyday and there are many days where no one shows up. But the security guard hung around for a few more hours. I put out my tent and tried to keep cool by not moving much and constantly hydrating. If a breeze was detected, I got up to cool the sweat on my back. The guard brought out this five-stringed instrument and knew how to pass the time. 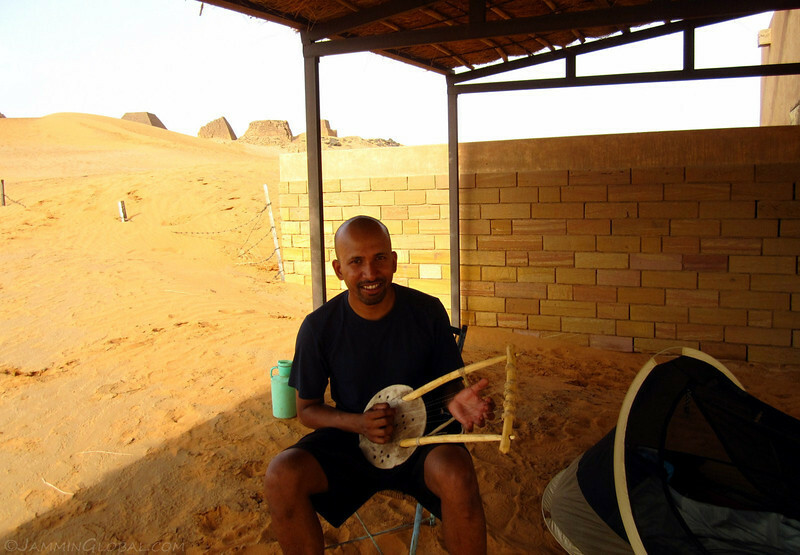 Playing a traditional Sudanese string instrument as I waited for the Sun to cool down at the Begrawiya Pyramids. The guard said this instrument was used in folk music, but it was slowly fading away. I don’t play the guitar but I imagined myself strumming like Rodrigo y Gabriela. At 6:30 pm it was finally cool enough to visit the pyramids and plus, the light was much better now. 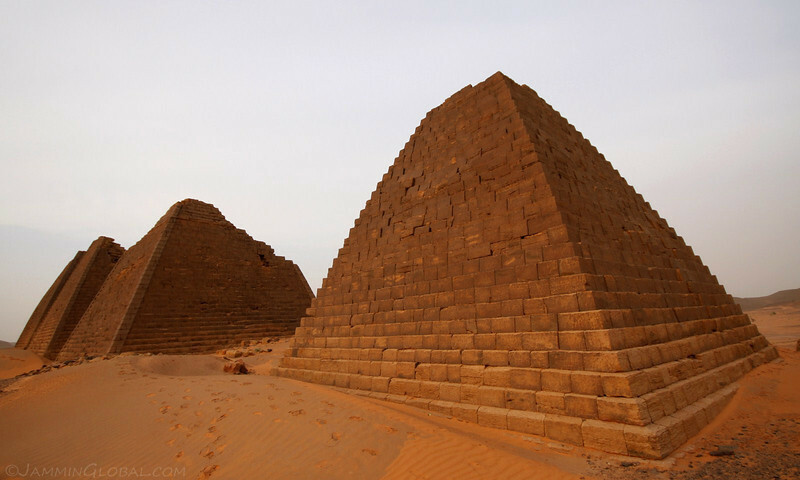 These pyramids serve the same purpose of the grander variety in Egypt, that of marking the tombs of royals. The design is different here, with smaller bricks used and the sides steeper. They’ve survived about 2,000 years, but some of them have fared worse and have given in to erosion. 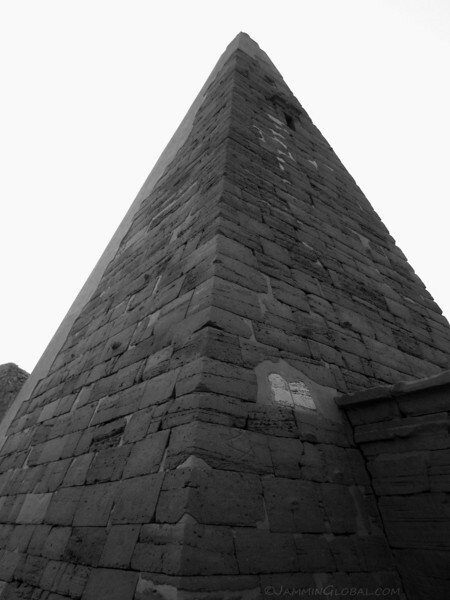 A reconstructed pyramid. The antiquities department has taken it upon themselves to rebuild some of the ruined pyramids. I’m not sure if I agree with that but it is nice to see how they once stood. A rebuilt gateway to a temple. This last Kushite Kingdom was pushed south due to continuing warfare with Egypt. 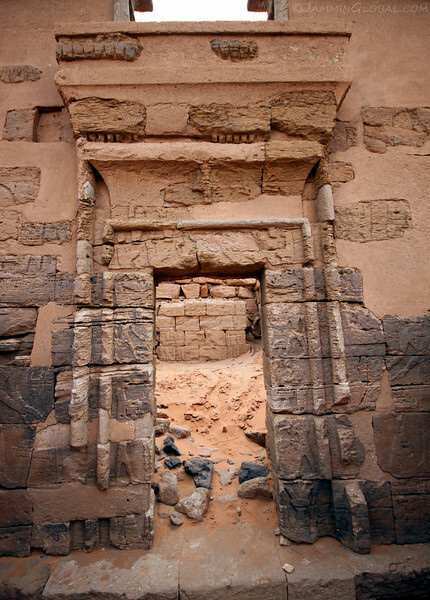 Entrances to the Nubians Pyramids of Meroe at Begrawiya. Detailed relief in the stone-work. 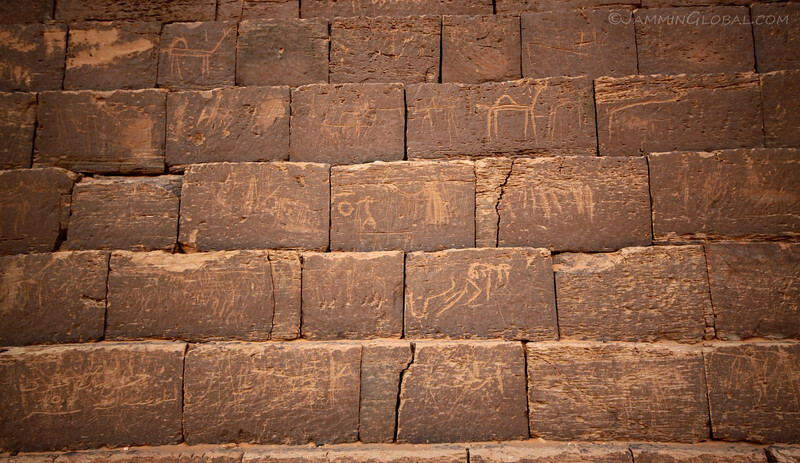 The Kingdom of Kush adopted the use of hieroglyphs from the Egyptians, but adapted them with local Nubian symbols. 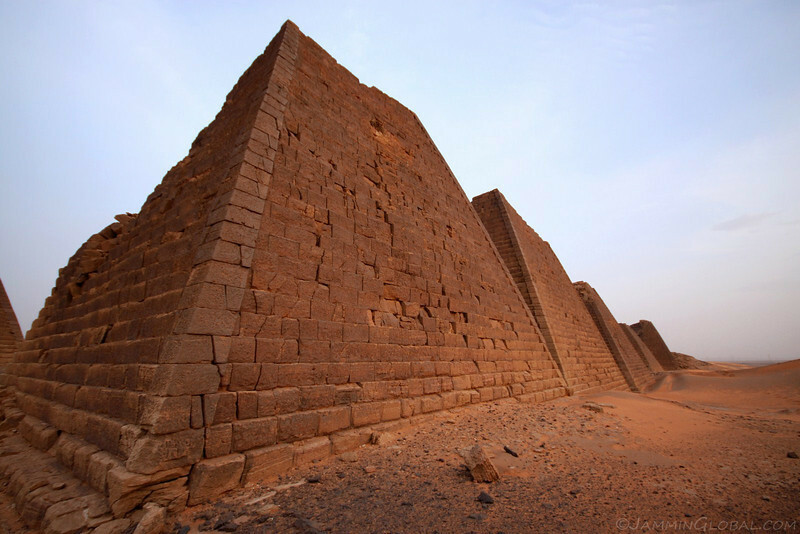 These Nubian pyramids were built very close to each other, indicating that either space was scarce back then or these were prized locations to have your tomb. 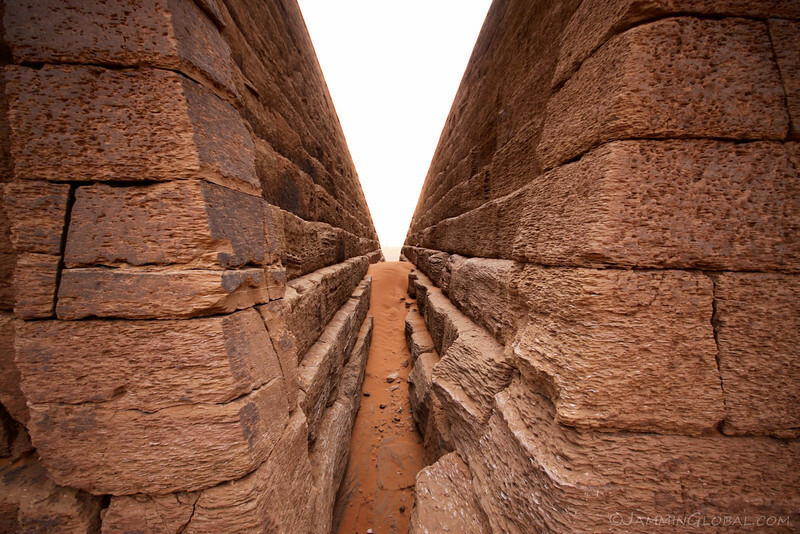 An imposing wall of the Nubian pyramids at Begrawiya. 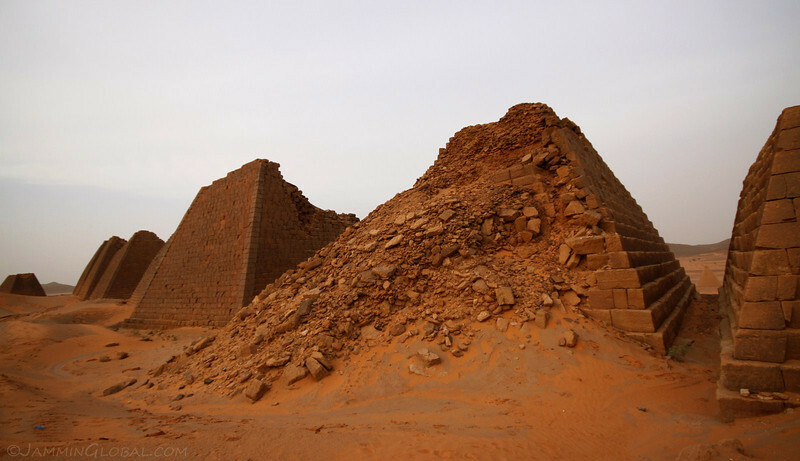 The Kushite Kingdom at Meroe was known for its iron smelting and was involved in international trade with India and China, 20 centuries ago, much like what’s happening in the present day in Sudan. 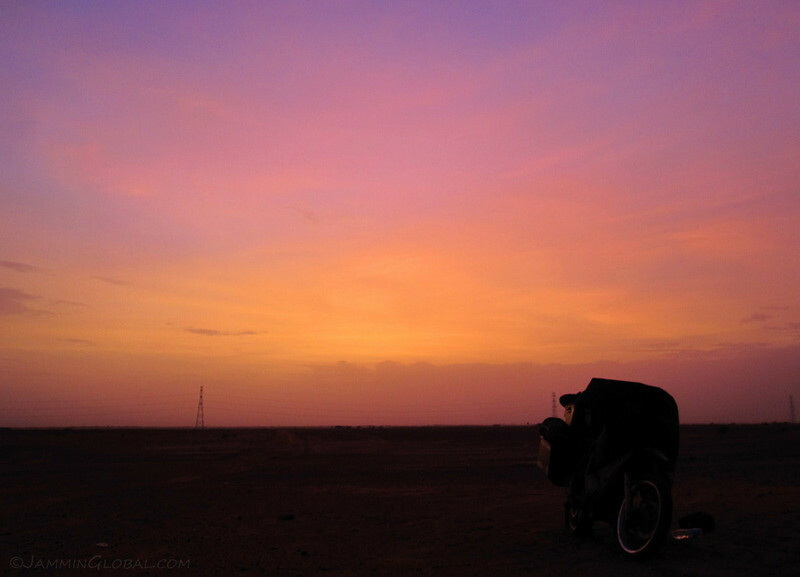 Another beautiful sunset in the deserts of northern Sudan. I had an excellent night, camping out next to these pyramids and woke up before sunrise to enjoy them in a different light. 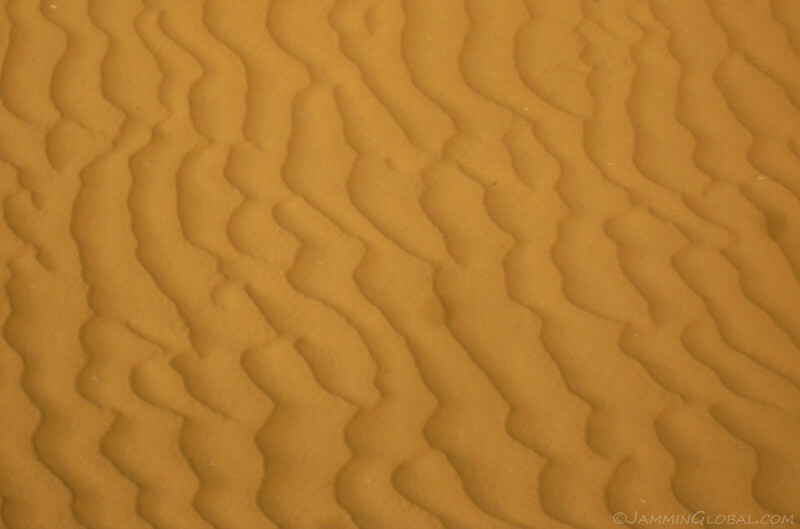 The shifting sands of the mighty Sahara. 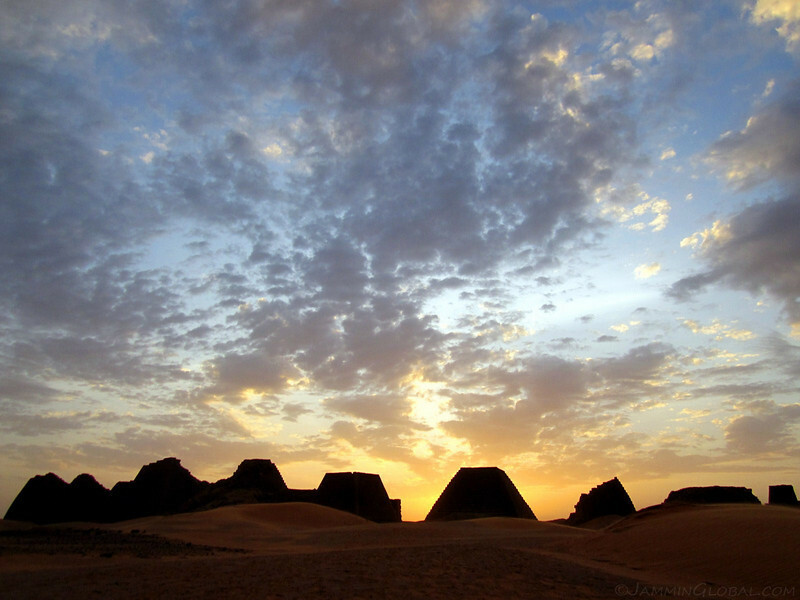 Just as the new day’s Sun rose up above the horizon, I captured this shot of the Pyramids of Meroe at Begrawiya. May they stand here for eons to come and help us reflect on how great our past is. 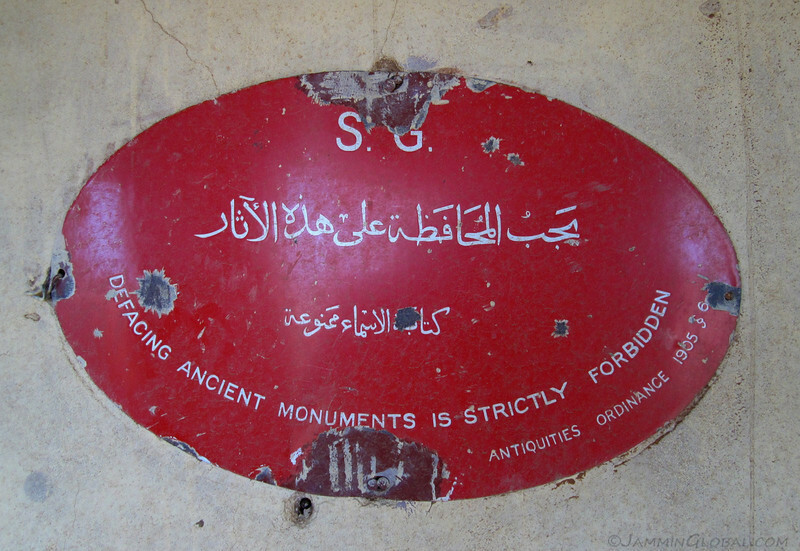 The monuments weren’t defaced as badly as the sign telling visitors not to deface them. I got rolling before the Sun got too hot and had to make a tricky u-turn in deep sand. It involved heavy throttle and fine steering balance. Something was lacking and sanDRina laid down for a nap. She’s a beast to lift up and I can do it myself, but it would take about two hours. So, I just waited for about 15 minutes and the lady who sold me the entry ticket came to work and helped me heave sanDRina back up. Now you see why I have some sponsor (Happy Trails) stickers on the bottom of my panniers. 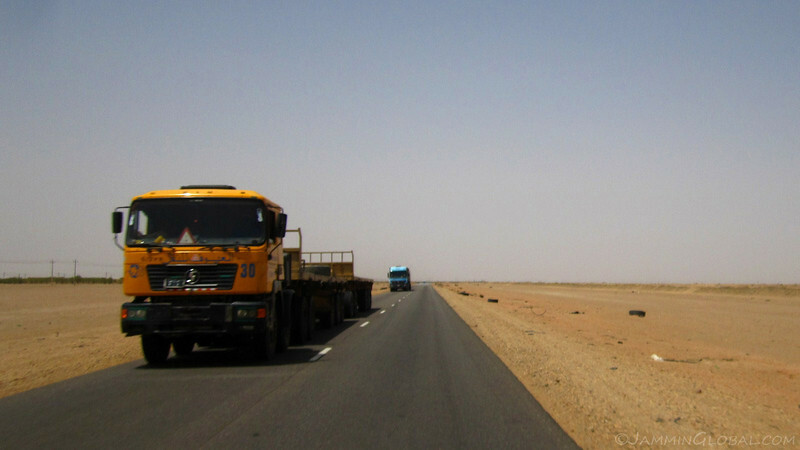 Back on the highway to Khartoum, which was about 200 kms (125 mi) away. 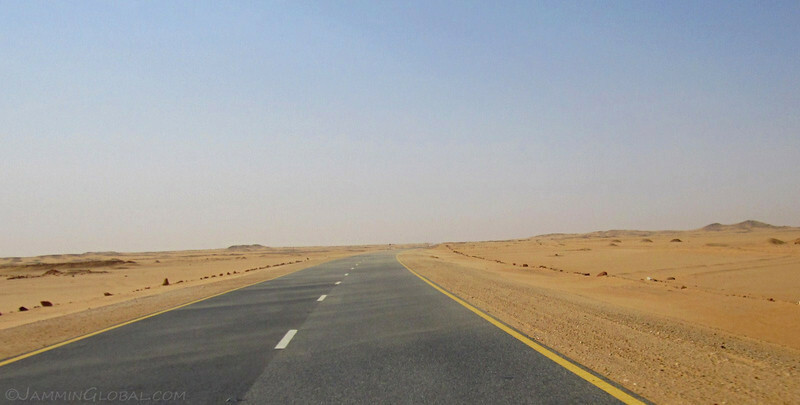 All though the landscape was bland, the winds were fierce and the buffeting from passing trucks made it an exciting ride. 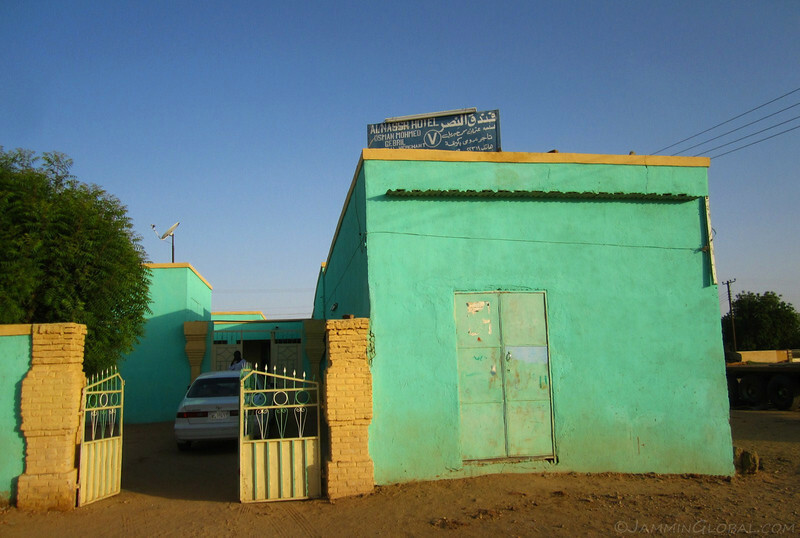 I had covered the top half of northern Sudan and enjoyed seeing the life in the small towns along the Nile. They’ve been around for centuries and will probably be around as long as the Nile keeps flowing. There’s a lot of history in the sands of Sudan, but due to a lack of development and the thorny stance of its president, this country will probably stay off the tourist trail for years to come. While that’s too bad for the local population, who yearn for more income opportunities, it’s great for the adventure traveler to come across grand pyramids in the desert with not another soul around. I was hoping you would go to Meroe. 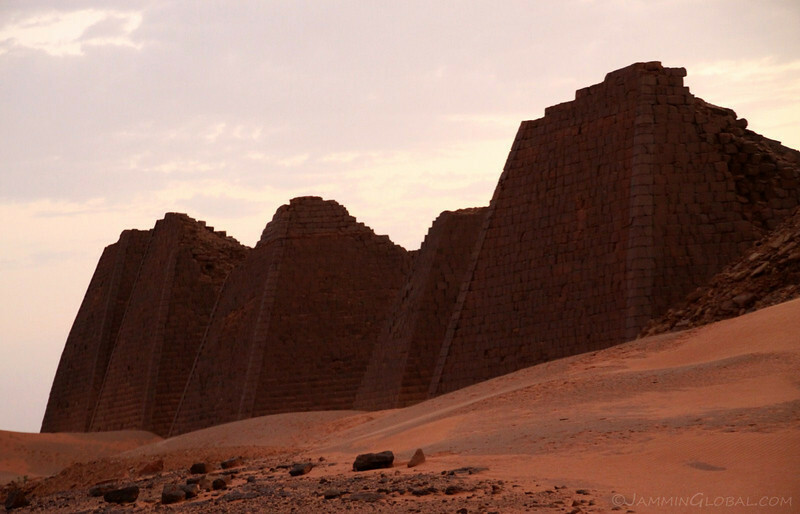 These are one of the best photos I have seen of the Pyramids of Meroe. You’re good. 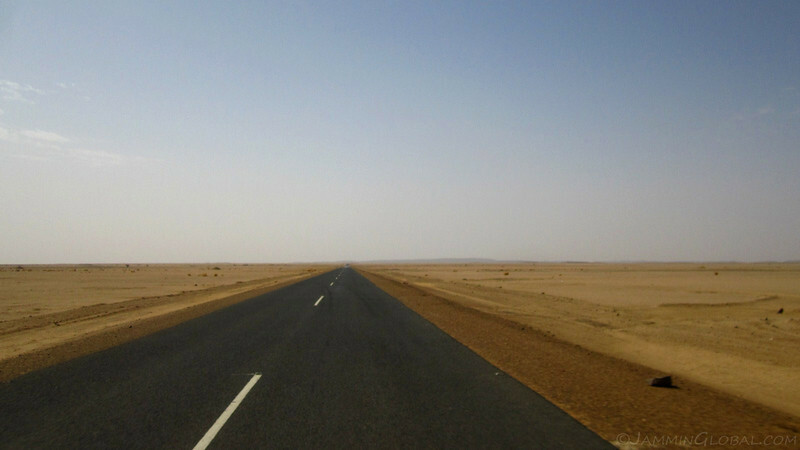 How many miles is it from Jebel Barkal to Meroe? Thank you for the typically Western unenlightened and unenlightening commentary on your visit to Northern Sudan. I especially enjoyed the comment about the pyramids having been built close together due to a lack of space for additional construction. (I suppose the builders failed to observe the distant horizon that your camera captured in the same shot.) Your comment on the sign “defaced” by time and a harsh climate was also especially astute.